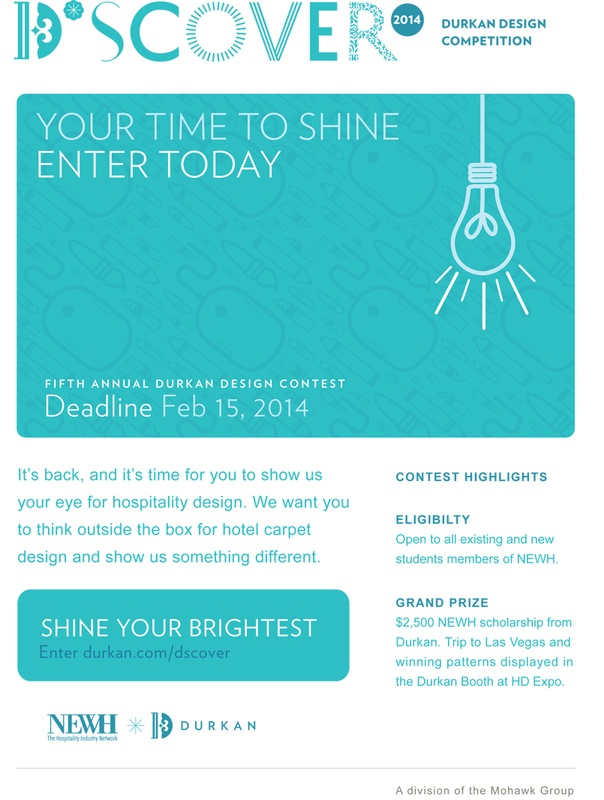 The Durkan D*SCOVER design competition has been established to exhibit the talent of designers in the hospitality design field and contribute toward the education of future designers, in partnership with NEWH. Students are encouraged to participate and be d*scovered! Durkan has partnered with NEWH to bring a unique member only opportunity. In lieu of entry fees, you simply must be a member of NEWH. Durkan is a leading US manufacturer of custom designed carpet to the hospitality industry. Specializing in durable Public Space, Corridor and Tufted carpet styles for guestrooms, Durkan offers solutions to any custom design need. As design leaders, we offer the largest selection of archived patterns in the USA or can make your custom design vision a reality. NEWH, The Network of the Hospitality Industry, is the premier networking resource for the hospitality industry, providing scholarships, education, leadership development, recognition of excellence, and business development opportunities. Members of NEWH, Inc. are professionals actively engaged in development, management/ operations, architecture, communications, design, distribution, education, manufacturing, production, purchasing, and sales of the Hospitality, Foodservice, Senior Living and related industries.